Long-duration drought can alter ecosystem plant species composition with subsequent effects on carbon cycling. We conducted a rainfall manipulation field experiment to address the question: how does drought-induced vegetation change, specifically shrub encroachment into grasslands, regulate impacts of subsequent drought on soil CO2 efflux (Rs) and its components (autotrophic and heterotrophic, Ra and Rh)? We conducted a two-year experiment in Inner Mongolia plateau, China, using constructed steppe communities including graminoids, shrubs and their mixture (graminoid + shrub) to test the effects of extreme-duration drought (60-yr return time) on Rs, Rh and Ra. Our results indicated that extreme-duration drought reduced net primary production, with subsequent effects on Rs, Rh and Ra in all three vegetation communities. There was a larger relative decline in Ra (35–54%) than Rs (30–37%) and Rh (28–35%). Interestingly, we found Rs in graminoids is higher than in shrubs under extreme drought. Meanwhile, Rh declines were largest in the shrub community. Although Ra and Rh both decreased rapidly during drought treatment, Rh recovered quickly after the drought, while Ra did not, limiting the Rs recovery. This study suggests that plant species composition regulates several aspects of soil CO2 efflux response to climate extremes. This regulation may be limited by above- and below-ground net primary production depending on soil water availability. 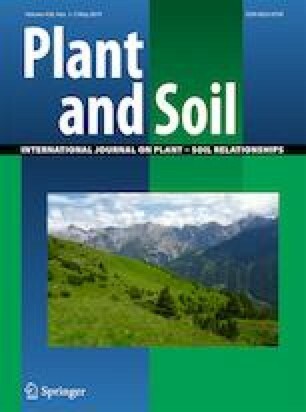 The results of this experiment address a critical knowledge gap in the relationship between soil respiration and plant species composition. With shrub encroachment into grasslands, total soil respiration is reduced and can partly offset the effect of reduction in productivity under drought stress. The online version of this article ( https://doi.org/10.1007/s11104-019-04025-w) contains supplementary material, which is available to authorized users. This project was funded by the CAS Strategic Priority Research Programmer (A) (Grant No. XDA20050103 and XDA19030202) and the funds for International Cooperation and Exchange of National Natural Science Foundation of China (Grant No. 31761123001 and 31761143018). We also show great appreciation for two anonymous reviewer’s suggestions.